Jewish Lights Publishing, 9781580233972, 208pp. Awaken your heart and mind to see your own capacity for wisdom, compassion and kindness. "When we awaken to our own light, it becomes possible to develop real wisdom about our life. As wisdom allows us to see clearly, our hearts break open with compassion for the struggles of our own lives and the lives of all beings. Awakened with wisdom and compassion, we are impelled to live our lives with kindness, and we are led to do whatever we can to repair the brokenness of our world." At last, a fresh take on meditation that draws on life experience and living life with greater clarity rather than the traditional method of rigorous study. Based on twenty-five years of bringing meaningful spiritual practice to the Jewish community, well-known meditation teacher and practitioner Rabbi Jeff Roth presents Jewish contemplative techniques that foster the development of a heart of wisdom and compassion. 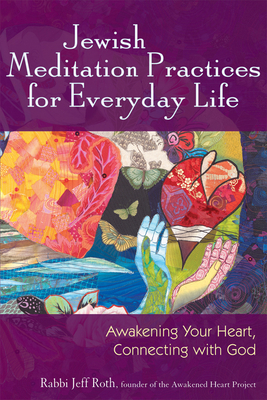 This contemporary approach to meditation--accessible to both beginners and experts alike--focuses on using the distilled wisdom of Buddhism and Judaism as a way to learn from life experience. By combining these two traditions, he presents a model that allows westerners--both Jews and non-Jews--to embrace timeless Eastern teachings without sacrificing their birth traditions.